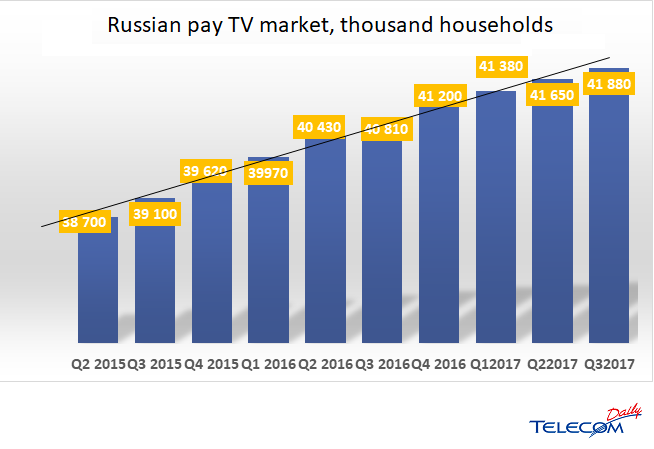 The Russian pay TV market reached 41.88 million households at the end of the third quarter of this year, according to TelecomDaily agency. However, growth in the third quarter amounted to only 0.23 million homes, according to TelecomDaily. Penetration of pay TV services was 73% at the end of the quarter. Average ARPU is RUB165 rubles per month. The five leading operators are Tricolor TV with 12.24 million households, Rostelecom with 9.66 million, ER-Telecom with 3.15 million, Orion with 3.032 million and MTS with 2,785 million households. Together these companies accounted for 90% of new contracts in the market, and Rostelecom alone accounted for 50% of additions in the quarter. ER-Telecom meanwhile grew its base by acquiring a significant number of smaller operators in the Russian regions.